Charles Haddon Spurgeon, (1834 - 1892) served for thirty years as preacher and pastor of London's six-thousand-seat Metropolitan Tabernacle. Converted in 1850 at the age of fifteen, he began to help the poor and to hand out tracts; he was known as "The Boy Preacher." He preached his first sermon at the age of sixteen. At age eighteen, he became the pastor of Waterbeach Baptist Chapel, preaching in a barn. In 1856, Spurgeon married Susannah Thompson; they had twin sons, both of whom later entered the ministry. 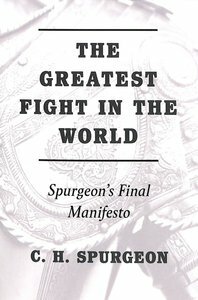 Spurgeon's compelling sermons and lively preaching style drew multitudes of people, and many came to Christ. Soon, the crowds had grown so large that they blocked the narrow streets near the church. Services eventually had to be held in rented halls, and Spurgeon often preached to congregations of more than ten thousand. The Metropolitan Tabernacle was built in 1861 to accommodate the large numbers of people. The prime minister of England, members of the royal family, and Florence Nightingale, among others, went to hear him preach. Spurgeon preached to an estimated ten million people throughout his life. Not surprisingly, he is called the "Prince of Preachers". In addition to his powerful preaching, Spurgeon founded and supported charitable outreaches, including educational institutions. He also founded the famous Stockwell Orphanage. His writings, including thousands of sermons, are still popular with pastors and devotional readers who, like him, treasure the gospel of God's grace.